Suffering from Bach fatigue and intrigued by electronic multimedia made flesh, neither snow, nor rain, nor gloom of night intimidated nearly 50 people from attending the David Sarnoff Library's concert this evening. And what a concert it was, alternately soothing and stimulating electronic music and images synchronized on Sarnoff Corporation's stage in two fascinating sets. 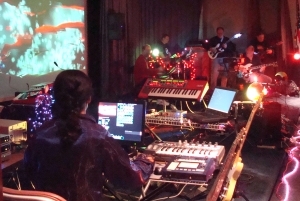 Brainstatik and Xeroid Entity opened while Hong Waltzer mixed a DVD and some software to project a shifting montage of imagery, patterns, and colors through an LCD projector, and Brain Statik's Ken Palmer provided arrays of fixed and fluid lighting on-stage. There was a little bit of everything--after all, you can do a lot with guitar, saxophone, drum, and piano synthesizers. When we have photos or links to the music, we'll post them, but take it on good authority that they were worthy heirs to the legacy of RCA's Harry Olson and the Mark I Music Synthesizer built at the RCA Labs in the early 1950s. After an intermission where the audience adjourned to Grover's Mill Coffee and McCaffrey's cookies as well as the Library's museum, the chamber players also known as the Martian Radio Orchestra--Howard Moscovitz, thereminist Kip Rosser, and Greg Waltzer--joined Brain Statik, Xeroid Entity, and Hong Waltzer onstage for another fascinating set of improvisations that gained sustained applause and enthusiastic endorsements by the happy crowd. Once again, the Library provided a space where people from a wide array of backgrounds and interests could bridge C. P. Snow's two cultures of art and science, and learn something about both as well as their combination. Will they be back? You bet; save Saturday night, March 15, for our spring equinox show! If that's too far away, make plans to visit during our open house and NJARC radio repair clinic on Saturday, January 19. Details will follow, but Brain Statik will be back, and Kip Rosser is a good bet to play the theremin. For now, let's thank them all for coming out, along with Library volunteers Sharon Chapman and Vrinda Kaimal for running the ticket booth and gift shop, and Dr. Rebecca Mercuri of the Princeton ACM/IEEE-CS group for making it all happen!